As yesterday the US market was closed due to the Independence Day, today USDCAD is under the influence of US Durable Goods (M/M) and Factory Orders. Today USDCAD created a bullish candle and it is still moving above the 61.8 of Fibonacci retracement however it is still falling the descendant channel. 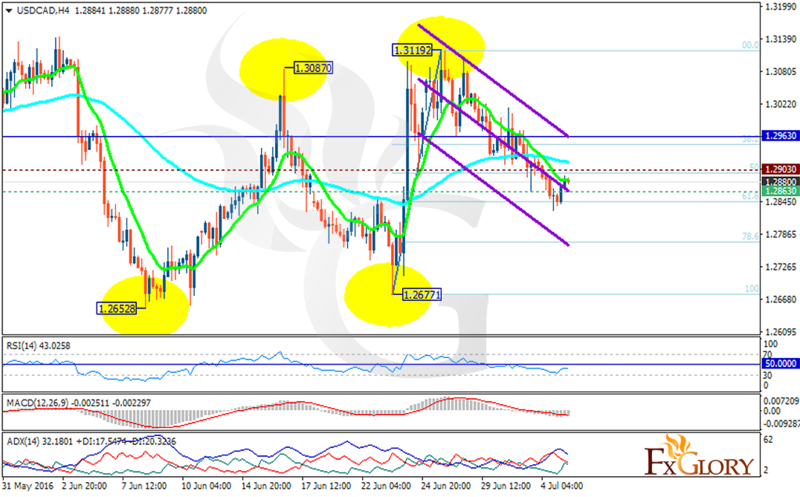 The support rests at 1.28630 with resistance at 1.29030 which both lines are below weekly pivot point at 1.29630. The EMA of 10 is below the EMA of 75. The RSI is below the 50 level, the MACD indicator is in negative territory while the ADX is showing strong buyers. In terms of the support level breakthrough the pair will fall to 1.2654 however as the price has already hit the 61.8 of Fibonacci retracement the resistance level breakout will push the pair upwards targeting 1.3187.